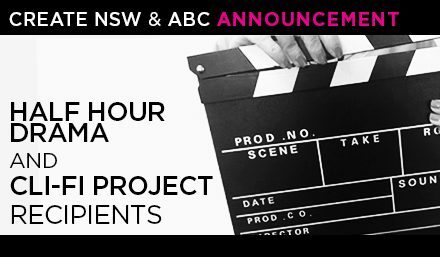 NSW-based filmmaker teams have been selected to attend an expert masterclass as part of the Half Hour Drama development partnership between Create NSW and the ABC, which will see character-driven 30-minute drama series’ with ‘heart and humour’ go into development. Following the international masterclass from key creators and showrunners of successful local and international productions in mid-2018, up to four projects will be selected to share $100,000 in funding from Create NSW and the ABC to further develop their half hour drama projects. At the same time, Create NSW, ABC TV and production company Jungle Entertainment have also announced eight new screen projects selected for development under the banner of Cli-Fi, the emerging genre that deals with climate change and global warming. The eight projects span a variety of themes including mysteries, drama, thrillers and comedies, with leading NSW writers finding inventive narratives to tell compelling climate stories. Grainne Brunsdon, Acting Executive Director of Create NSW said, “The call for Half Hour Drama pitches received a phenomenal level of interest and it was extremely difficult in selecting our masterclass teams. However, combined with our strong and creative final Cli-Fi projects, we are very excited about the fantastic mix of diverse stories we are taking forward for further development.